Xtralok Roller Door Anchor. Weather Step. For Rebated Concrete. Semi circle floor plate for use on concrete floors with rebated weather step. Can be fitted on top of weather steps inside the door. Can be reversed to sit at the bottom of the step. 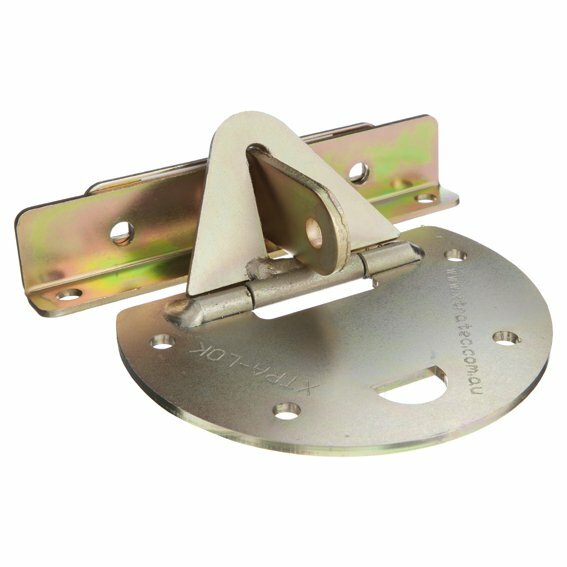 Includes door bracket, plate and all fasteners. Secure with a padlock (not included). 9 mm staple hole diameter. Solid zinc treated steel. 304 grade stainless steel hinge pin.